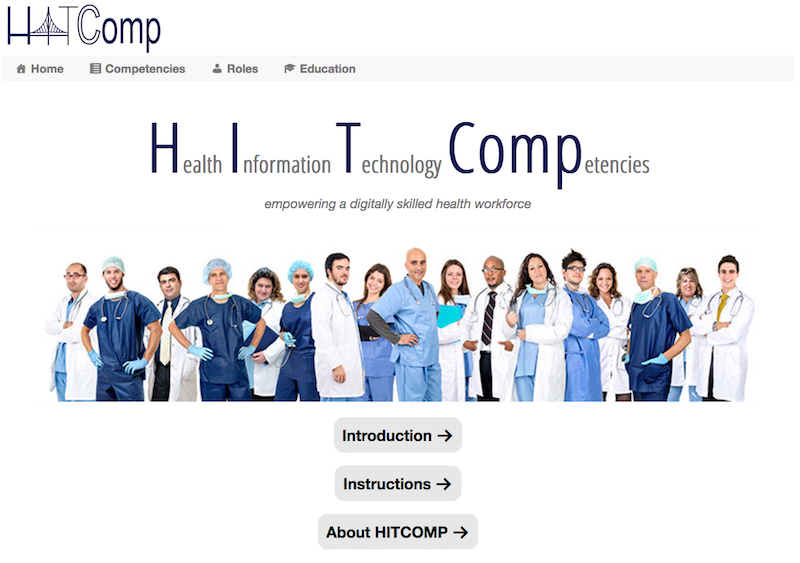 The HITCOMP site home page contains direct links to informational pages about the HITCOMP tool: an introduction, detailed instructions, and information about the HITCOMP sponsoring project and its creators. You can always navigate back to the Home page by clicking on the tab labeled Home for further information. There are several ways to use HITCOMP. There are four tabs (Home, Competencies, Roles and Education). Both the Competencies and Roles tabs are organized similarly. The top portion of the page contains a list of Filters you can use to narrow down your search. If any terms in the filters or table data are unfamiliar to you, a link to a glossary of terms is available at the top right of these pages. On the Competencies tab, the filters that can be chosen from include: domain, level, competency quadrant, and area of competency. All filter choices are optional. Baseline (orange): A foundation level upon which all other skills and competencies are based. Basic (green): An entry-level or beginning skill or competency level, equating to “understanding” and “knowing” in Bloom’s Taxonomy. Could potentially align with associate-level degree academic programs or curricular competencies in eHealth/HIT. Intermediate (rose): A mid-level incumbent skill or competency level, equating to “applying” and “analyzing” in Bloom’s Taxonomy. Could potentially align with baccalaureate-degree level academic programs or curricular competencies in eHealth/HIT. Advanced (blue): A high-level incumbent skill or competency level, equating to “evaluating” and “synthesizing” in Bloom’s Taxonomy. Could potentially align with baccalaureate- to master-degree level academic programs or curricular competencies in eHealth/HIT. Expert (purple): The highest level of skill or competency level, also equating to “evaluating” and “synthesizing” in Bloom’s Taxonomy. Could potentially align with master- to post-doctoral-degree level academic programs or curricular competencies in eHealth/HIT. Note/Disclaimer: Levels do not correspond one-to-one to job progression or role levels and can vary by role, organization and location. Area of Competency: One of 33 specialized areas of competency, from access, to care coordination, to documentation, to privacy and security, to quality and safety, and others. To change options or start a new search, you can reset the filters. On the Competencies tab, there is also a free form text search field entitled “Competencies” that can be used to search for any known competency in the repository. Below the filters, there is also a secondary text search field that does a text search on competencies, roles and education tabs. The next portion of the page contains a line that lists the data results for a given search, stated as “Showing X to X, of 1,025 entries”. By default, before any filters are chosen, the list displayed contains all competencies and roles. On the right, there is an icon list that allows you to export your list of competencies or roles based on your preferred method: Print (prints directly to the user’s attached printer), Excel (saves as a Microsoft .xlsx file), CSV (comma-separated values – an alternative choice for Excel) or PDF (an Adobe Portable Document Format). You can perform a mapping search by competency or by role. On the Competencies tab, select your filters as desired. A real-time update of data displays in the Data Results table. The default sort is first by code. You can click on the arrows next to each column heading on the Data Results table to re-sort your results by that column. Under the Level column, you can click on the icon next to any level to perform a search by roles for that level. The Roles tab will display, and all roles associated with that level will be displayed in the Data Results table. If desired, you can export your results using any of the export icons in the Data Results section. On the Roles tab, you have a choice to localize your view of roles based on language. The default selection is English (US) and (UK). Alternate selection choices include French (FR), German (DE), Italian (IT), and Spanish (ES). You can add a role translation by clicking on a button to toggle that column on or off. Currently, only the Role Names are displayed in your chosen alternate selection language. Select your filters as desired. You can filter by domain, role type, level and service category. The default display is alphabetical, by role name, in English (US). Once a filter choice is selected, a real-time list displays in the Data Results. You can click on the arrows next to each column heading on the Data Results to re-sort your results by that column. Under the Level column, you can click on the icon next to any level to perform a search for competencies associated with that role. The Competencies tab will display, and all competencies associated with that level will be displayed in the Data Results. On the Education tab, a user can research where to find training within the Foundational Curricula for each Area of Competency, and ultimately, for each competency within that area. For each Area of Competency, in the left column, the user will find one or more corresponding modules (in the right column) that contain training for the area in the Foundational Curricula. Each module is explained in the table on the bottom of the page. Under the Area of Competency column, the user can click on the icon next to any area to perform a search by Competencies for that level. The Competencies tab will display, with the indicated Area of Competency preselected and all applicable competencies shown.